Dr. Kearney is proud to offer patients BodyTite by Inmode which is an advanced body contouring and skin tightening system that gives surgical results without the scars. It’s a great solution for individuals who are looking to reduce fat while also wanting to tighten and lift loose skin, which is often the result of weight loss, aging or childbirth. As patient interest in non-surgical solutions rises, BodyTite allows Dr. Kearney to offer another treatment option that can help patients achieve a more youthful appearance without having to undergo traditional surgery. Never before have we seen a machine deliver surgery-like results without the incisions and downtime of traditional surgery. BodyTite uses RFAL (Radio-Frequency Assisted Lipolysis) technology to deliver highly controlled radiofrequency energy that causes skin and subcutaneous tissue to contract. After administering a local anesthetic, Dr. Kearney inserts a small cannula beneath the skin with an external electrode placed on the skin’s surface. This highly-controlled thermal field works by delivering rapid and uniform heating which simultaneously liquefies the fat under the skin and “shrink wraps” the tissue. System safeguards regulate skin temperature to ensure patient safety. BodyTite can be used on the upper arms, abdomen, thighs, knees, and even the breasts in some cases. An improvement can be seen soon after treatment with the most noticeable results appearing in 3-6 months and skin contraction can continue for up to a year. BodyTite can also be used for patients who don’t necessarily have excess fat but just want an improvement in skin laxity. 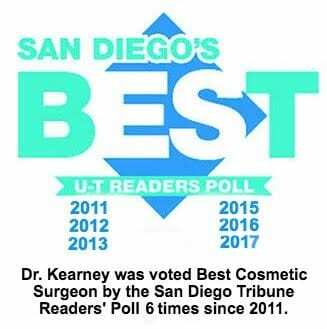 The BodyTite procedure must be performed by a skilled physician and Dr. Kearney is one of the very first Plastic Surgeons in San Diego to offer BodyTite. The machine is ONLY available to Board Certified Plastic Surgeons. For more information about Board Certification click here. To find out if BodyTite is right for you, contact our San Diego office.